It is our passion to connect people to churches and ultimately to Jesus. 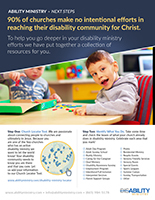 We are continually working to provide helpful resources for starting and growing your disability ministry! Take a look at the various sections below, and as always, feel free to reach out to us if you have any questions are if you are wanting something specific for your ministry. Here is a collection of recommended reading. Click here to use our disability ministry locator tool. 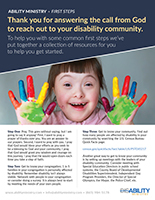 Click here to browse helpful links and disability resources. We have volumes of helpful articles, stories, and testimonies available on our blog. Click here to browse our Ability Ministry videos. Every disability ministry is unique based upon the make up of the church and the community. To help you with some common first steps we’ve put together a collection of resources for you to help you get started. 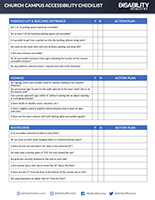 Our First Steps document is a 2-page quick reference guide featuring steps you can take to continue your ministry. 90% of churches make no intentional efforts in reaching their disability community for Christ. Thank you for being a leader in this emerging ministry and being a 10% church! To help you go deeper in your disability ministry efforts we have put together a collection of resources for you. This resource will walk you through your campus all the way from the parking lot to your worship center, restrooms, and more.